What share of American adults use social media? Which social networks are the most popular? How is the popularity of platforms changing over time? Getting straight answers to these questions can be a struggle for marketers; all too often data on usage comes from companies with their own agendas to push. 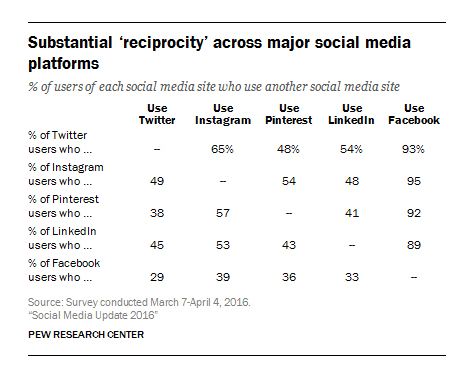 Luckily, there’s the Pew Research Center’s social media update. This annual report from the non-profit institution uses a rigorous methodology, including unbiased questions and a nationally representative phone poll conducted in both English and Spanish, to understand the online habits of Americans. The report has a few limitations—specifically, it only examines five social networks (Facebook, Instagram, Pinterest, LinkedIn, and Twitter)—but it’s still one of the most reliable sources for determining social media behavior and trends. Facebook is (by far) the most popular social network: Some 68% of US adults use Facebook. This compares with 28% who use Instagram, 26% who use Pinterest, 25% who use LinkedIn, and 21% who use Twitter. Facebook’s dominance is even more apparent with online users. Some 79% of American adults with Internet access use Facebook, more than double the share that uses Twitter (24%), Pinterest (31%), Instagram (32%), or LinkedIn (29%). Facebook is hugely popular across all demographics: Facebook is used at high rates across all income levels and educational levels. 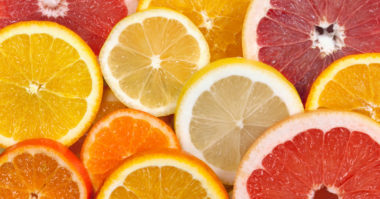 It’s also very popular with suburban, urban, and rural consumers. Three-quarters of American men use the service and an even greater share of women (83%) do so. The platform remains popular with young adults (88% of respondents age 18–29 use it), and is now even used by 62% of Americans age 65+. Facebook has the most engaged user base: Just over three-quarters (76%) of Facebook users say they visit the site daily (55% multiple times a day; 22% once per day). This is up from 70% who said the same in 2015. 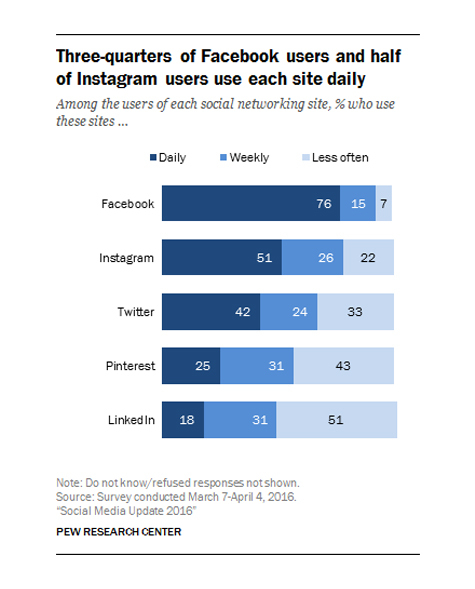 Around half (51%) of Instagram users say they check the platform on a daily basis, with 35% saying they do so multiple times a day; 42% of Twitter users say they are daily visitors, with 23% saying they visit multiple times a day. Only 25% of Pinterest users and 18% of LinkedIn users say they are daily visitors to the platforms. 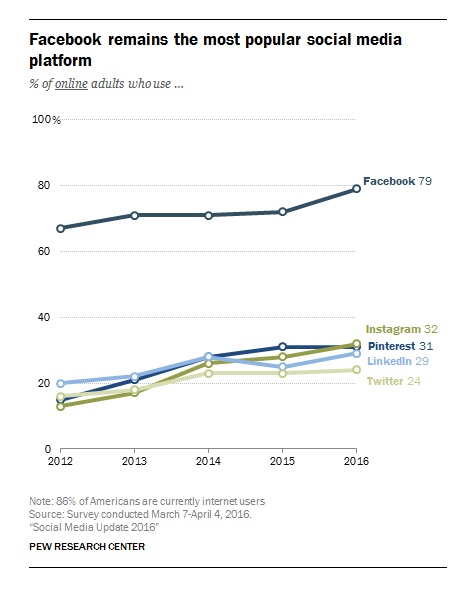 Most Americans use multiple social networks: More than half (56%) of online adults in the United States say they use more than one of the five social media platforms examined in the report. This is up from the 52% who said the same in 2014. 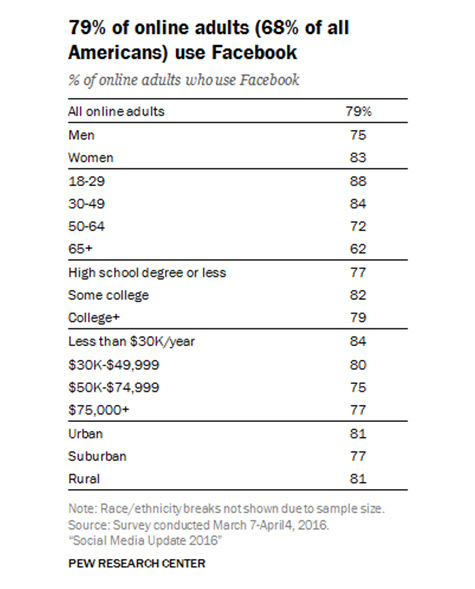 Among American adults who say they only use one social media platform, 88% indicate that Facebook is the sole network they use. Not surprisingly, given its popularity, Facebook has the most overlap with other social networks: 93% of Twitter users, 95% of Instagram users, and 92% of Pinterest users say they are also on Facebook. Messaging apps are much more popular with younger consumers: Nearly a third (29%) of American adults with smartphones say they use general-purpose messaging apps such as WhatsApp or Kik; 24% say they use messaging apps that automatically delete messages, such as Snapchat or Wickr. 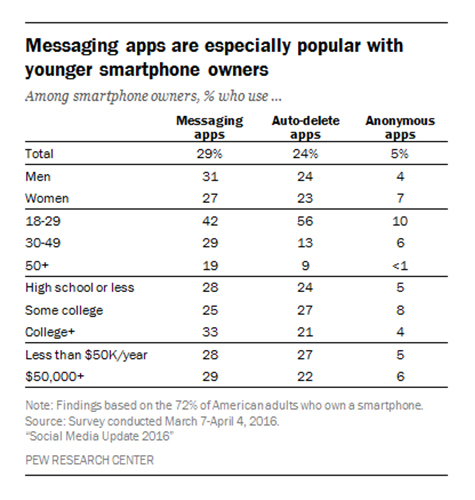 Messaging apps are used at far higher rates by younger consumers: 56% of smartphone owners ages 18–29 say they use auto-delete apps, compared with just 13% of smartphone owners ages 30–49 and 9% of smartphone owners age 50+. Keep up with the latest trends in social media marketing. 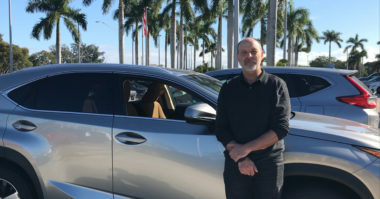 Contact MDG Advertising today at 561-338-7797 or visit mdgadvertising.com.